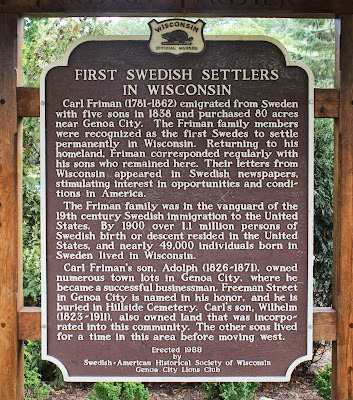 The Friman family was in the vanguard of the 19th century Swedish immigration to the United States. By 1900 over 1.1 million persons of Swedish birth or descent resided in the United States, and nearly 49,000 individuals born in Sweden lived in Wisconsin. Carl Friman’s son, Adolph (1826-1871), owned numerous town lots in Genoa City, where he became a successful businessman. Freeman Street in Genoa City is named in his honor, and he is buried in Hillside Cemetery. Carl’s son, Wilhelm (1823-1911), also owned land that was incorporated into this community. The other sons lived for a time in this area before moving west. The marker is located inside Veteran's Memorial Park, 698 Fellows Road, Geona City, Wisconsin 53128. See photos and detailed directions below; the marker is inside the park, and not visible from the park parking lot. See also, Genoa City Veterans Memorial, also at this location. a young farmer bids a sober farewell to friends and relatives. This is the most elaborate marker site I have seen in Wisconsin! (you can kinda see it peeking beneath the last tree). then walk down the path to the marker; you can't miss it.